Tennessee is divided into three grand divisions, with West Tennessee generally stretching from the Tennessee River west to the Mississippi River. There are several Tennessee State Parks near Memphis in this region, making for day trip options or easy weekend getaways. 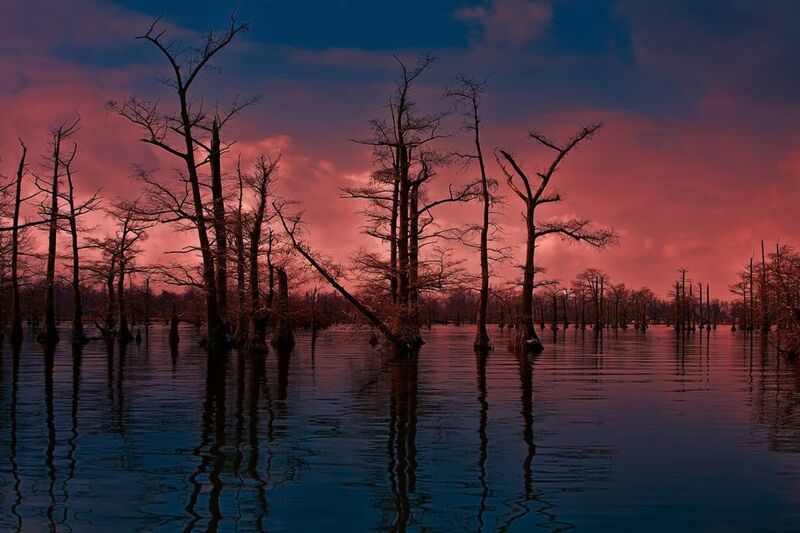 Reelfoot Lake State Park is in Northwest Tennessee where it contains a 15,000-acre lake that was created by the massive earthquakes along the New Madrid Fault in 1811-1812. The quake caused the Mississippi River to flow backward, which created the lake. Today, the park is known as a place to view wildlife, including bald eagles. The lake is a flooded forest with cypress trees above and below the water’s surface. Daily bald eagle tours take place in January and February when thousands of American bald eagles call the lake home. The lake features boating and fishing, and the park has several hiking trails for bird watching and wildlife viewing. There are two campgrounds. Fort Pillow State Park sits 40 miles north of Memphis. At the heart of the park is the 1,642-acre Fort Pillow that is known for its preserved breastworks and reconstructed inner fort. The park sits on steep bluffs that overlook the Mississippi River, which made it a strategic spot during the Civil War. The fort was built in 1861 by Confederate troops and was abandoned in 1862 because of the Union Navy’s advancement along the river. The park’s museum includes Civil War artifacts and displays that relate to the history of the fort. There is a 12-minute video on the 1864 battle that is shown by request. A campground features 32 sites, six of which accommodate RVs. There is a moderate five-mile hiking trail that leads to backcountry camping. Meeman-Shelby Forest State Park is a favorite for cross-country runners, hikers and mountain bikers for its abundance of trails and proximity to Memphis. The 13,476-acre park sits on hardwood bottomland adjacent to the Mississippi River just 13 miles north of Memphis. There are more than 20 miles of trails, highlighted by the eight-mile Chickasaw Bluff Trail. The park features swamps as well as forests deep with trees that sit high on the Chickasaw Bluffs above the river. The park is a favorite for bird-watchers with some 200 species of songbirds, waterfowl, shorebirds, and birds of prey. A nature center is open on the weekends with exhibits including live snakes, turtles, salamanders, fish aquariums, a stuffed animal exhibit, indoor live butterfly garden, bone table, insect table, and a Native American exhibit. The park features six two-bedroom cabins and a campground with 49 campsites. It also contains a 36-hole disc golf course that is divided into two 18-hole courses. T.O. Fuller State Park sits in the southwest corner of Memphis. The 1,138-acre park consists of diverse terrain, from the Mississippi River floodplains to high bluff ridges. It was the first state park that was opened for African-Americans east of the Mississippi River. The park is named for Dr. Thomas O. Fuller, who spent his life educating African-Americans. The park’s construction was begun in 1938 as part of a Civilian Conservation Corps project. A big part of the park is the Chucalissa Indian Village, which is operated by the University of Memphis. This village was uncovered in 1940 during excavation work for a swimming pool. The prehistoric village includes preserved archaeological excavations and a modern museum. The park’s hiking trails include the four-mile Discovery Trail loop that gives visitors views of the Chucalissa Indian Village and surrounding wetlands. The park also features 35 picnic tables and four shelters for groups. Big Cypress Tree State Park is in Greenfield, just south of Martin. The park is named for the national champion bald cypress tree that lived in the park until a lightning strike in 1976 killed the tree. At the time, it was the largest bald cypress in the U.S. and the largest tree of any species east of the Mississippi River. The tree had lived for more than 1,350 years. The park is popular for picnicking and birdwatching. Once complete, the park will feature a boardwalk handicapped trail to the Big Cypress Tree River. The park contains a variety of native wildflowers and trees such as showy evening primrose, black-eyed Susans, yellow poplar, bald cypress, and dogwood. Pinson Mounds State Park is in Pinson, just south of Jackson. The Pinson Mounds State Archaeological Park sits on more than 1,200 acres and contains at least 15 Native American mounds. The mounds were used for burial and ceremonial purposes. Pinson Mounds became a Tennessee State Park in 1974 and is also a national historic landmark and is listed on the National Register of Historic Places. The park contains the largest Native American Middle Woodland Period mound group in the U.S. The park features a museum that replicates a mound. It includes 4,500 square feet of exhibit space, an archaeological library, theater and Discovery Room for historical exploration. The park contains hiking trails that allow access to the mounds and picnic facilities. There are four cabins onsite. Big Hill Pond State Park sits on 4,138 acres of timberland and hardwood bottomland in southwest McNairy County. The park’s name comes from the 35-acre Big Hill Pond that was created in 1853 when soil was scooped from a borrow pit to build a levee across the Tuscumbia and Cypress Creek bottoms for the railroad. Cypress trees now grow in and around the lake. Hiking is a favorite at the park, including a path that finds its way to the 70-foot observation tower over the trees and Travis McNatt Lake. There are some 30 miles of overnight and day use trails with four backpack trail shelters. There are 14 miles of horse trails that are shared with mountain bikers. Camping and fishing are also available. Today, Pickwick Landing State Park is a vacation favorite for Memphians. But in the 1840s, it was a riverboat stop along the Tennessee River. In the 1930s the Tennessee Valley Authority located one of its dams on the river at Pickwick Landing. The living area for those TVA construction crews and their families today is the state park. Pickwick Village was then known as the TVA Village, and today is home to a Post Office, park office and day use area. Pickwick Landing State Park consists of 681 acres and offers plenty of fishing and watersport activities. The park includes a golf course, with eight holes overlooking the water. The park contains three public swimming beaches; Circle Beach and Sandy Beach are in the park’s day use area and the third is across the lake at Bruton Branch primitive area. Pickwick State Park’s inn has 119 rooms and an indoor pool and outdoor pool. Cabins are located near the inn and guests staying there can access the amenities of the inn. There are 48 wooded campsites and a primitive campground on the north side of the lake. The Natchez Trace from Natchez, Mississippi, to Nashville, Tennessee, is a bit east of the location of Natchez Trace State Park, but the park is located on an alternate route of the old path. The park is located on the west side of the Tennessee River on about 48,000 acres that were purchased during the New Deal. The Civilian Conservation Corps and Works Progress Administration built many of the buildings in use today. The park has 13.5 miles of hiking trails, ranging from a half-mile trail up to 4.5 miles. There also is a 40-mile overnight trail. A park museum focuses on local history. There is camping, cabins, and lodges. The park features four lakes – 58-acre Cub Lake, 690-acre Pin Oak Lake, 90-acre Maple Creek Lake, and 167-acre Brown’s Creek Lake. There also are 250 miles of horse riding trails on the south end of the park. Paris Landing State Park is located near Kentucky along the Tennessee River. The park was founded in 1945 and was named after a steamboat and freight landing on the river. The 841-acre park is on the western shore of the river, which is dammed to form the 160,000-acre Kentucky Lake. The park is on the widest part of the lake and offers opportunities for water sports such as fishing, boating, swimming, and waterskiing. The park also offers golf, hiking, and camping. The park has a public swimming area and beach on Kentucky Lake with restrooms and a picnic area. A public Olympic-size swimming pool and children’s pool facility is open from Memorial Day through the first week of August. Nathan Bedford Forrest State Park sits on one of the highest points in West Tennessee, Pilot Knob. It overlooks the Tennessee River and is home to the Tennessee River Folklife Interpretive Center and Museum. The park contains 25 miles of hiking trails. It’s located on Kentucky Lake where commercial marinas and public boat docks offer boating and fishing opportunities. The park features eight cabins that overlook the lake as well as a rustic log cabin. There are three campgrounds, two of which are primitive.